Its been a month since I left Japan with its matcha tea, red bean paste sweets, iced coffee, soba and sashimi, temples, castles, forests of bamboo, subways and hot baths. As I sit here in rainy and cold Oregon to write, I miss all of it — but mostly I miss the hot baths. Pause… No, that’s not right. As I check inside I realize that I miss my Japanese friends and all the people I started to get to know and who shared so much of their hearts and lives with me. Yes! That’s what I miss, close connections and so much kindness. Ah, yes… this feels right. I feel gratitude for having had the chance to share Community Wellness Focusing and the way Nina Joy Lawrence and I collaborated with Afghans to develop Focusing programs in Afghanistan and Pakistan. In the workshops and gatherings with nine different groups from Sendai to Kyoto and back to Tokyo I shared two key aspects of our approach: 1) that one does not have to wait to be “fully trained” in order share what one knows and experiences in Focusing; and 2) ways to design a local program that meets the needs of a community as people make use of their own metaphors to ground Focusing so that it makes sense to them and is easier to learn. It turns out that the best time to start teaching anything is when you are just beginning to learn the new skill. It is at this time that you are most excited, enthusiastic and close to the most basic concepts of the process. Peer teaching and learning is effective as it helps the “teacher” hone new skills/knowledge as you share what you learn. The learner also benefits because the way of sharing relies on the experiential. The longer one waits before sharing what one has learned about Focusing, the harder it becomes. It’s easy to be intimidated by the depth of the philosophy and the intricacies of approach. By the time one has had level 3 or 4, it seems so complicated. How could you possibly teach it without making mistakes? Yet, Nina Joy and I were teaching Focusing to Afghan refugees in Pakistan in 2001 when she had only taken two levels and I had none. The needs of the Afghans were so great that we could not wait to learn all the levels before sharing something that might help them. I learned from Nina Joy as we went, helping lead workshops in an exploration of a concept and then joining in as a participant to practice the technique we had just discussed. When Nina Joy and I started teaching in Pakistan, we did not know what we were doing. Nina Joy knew that Focusing could be a powerful tool for healing. I knew nothing about it. But, not being skilled Focusing teachers meant that we relied on our Afghans colleagues to help share Focusing in a way that would make sense for them in their daily lives. It was serendipity that we included the Guesthouse imagery in the training, based on the Rumi poem that Nina Joy had on her computer. Little did we know how important that single metaphor would be in our training. As it turned out, the way Afghans view guests (to be treated respectfully and with kindness) is just the way one would want to hold whatever comes inside as we Focus. To be with a guest in the guesthouse with kindness and without judgment fit very well with Ann Weiser Cornell and Barbara McGavin’s notion of “self in presence” of Inner Relationship Focusing. And in Afghanistan the guesthouse is the place where guests can be cared for that is separate from the family’s living space, allowing for a place of privacy that guests would not enter without permission. In the same way, one can sit with the felt sense guest in the inner guesthouse, but move into a safe place away from it if it feels overwhelming (akin to Clearing a Space). 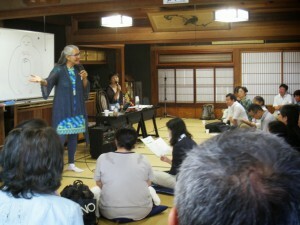 As I introduced this notion to Japanese participants, many said that this was the traditional way guests had been treated in their communities and that the method helped them in their own Focusing. Yet, the purpose of teaching Guesthouse Focusing was to illustrate the value of finding local metaphors and symbols that fit so that people can give voice to their inner “guests” in a way that feels natural and meaningful. For the Afghans, having a “something inside” carried less meaning than to say “I have a guest in me that wants attention.” When checking inside for what comes, the steps in Inner Relationship Focusing include “noticing something”, being with the “something” and describing the “something.” With Guesthouse Focusing, one “says hello to whatever guest comes”, “describes the guest”, “gets to know the guest” and “listens to what the guest wants the Focuser to know.” My challenge to participants in Japan was to think about what would give meaning to that which is inside in a Japanese way. What is the language that works? It’s not about translating this Guesthouse Focusing into Japanese; it is about paying attention to what is happening on the inside and articulating what comes through local metaphors, language and customs. Words came, as well as images that might work— such as evoking the felt sense through haiku poetry, kendo or some types of Buddhist mediation. Each group had their own lists and there may come many different ways to be with what comes that can be articulated in a very Japanese way. Early in my trip I realized that many Japanese were attracted to Focusing and I asked Hikasa San, why. She told me that the Japanese people already have a sense of the basics of Focusing—it is after all a human process—and this ability only needed a voice, which Focusing gives to it. That makes it easier to share. Many participants came to me after each workshop with ideas of how they want to share Focusing in new ways–friend to friend, colleague to colleague, community to community. As I take this in, I feel energy and connection. I come back in my body to gratitude for all I learned from participants in the many workshops. I want to thank each and every one who helped on this journey. What I sense underneath this is potential. I can imagine the world filled with people who can stop, listen and pay attention to what comes inside as they reach out to those around them.